Why is the lad in this St Patrick’s Day worksheet lucky? Because he has a four leaf clover. 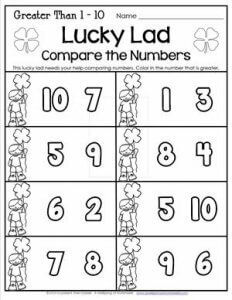 You’re kids can be lucky, too by showing you how they know how to compare numbers. They simply look at the numbers in each set and color in the number that is greater. Of course, they might want to use green and they just might want to color in a few four leaf clovers, just for good luck.